September 2, 1806 - the village of Goldau was destroyed by a landslide, coming from the mountain of Rossberg - nearly 500 people died. It was the first time that a naturalistic approach to a geological catastrophe was chosen instead of the assumption that the landslide was a punishment by god. Thanks' to the meticulous work of the naturalists we have a large amount of eyewitness reports of the landslide and its aftermath, and can reconstruct in great detail the catastrophe. 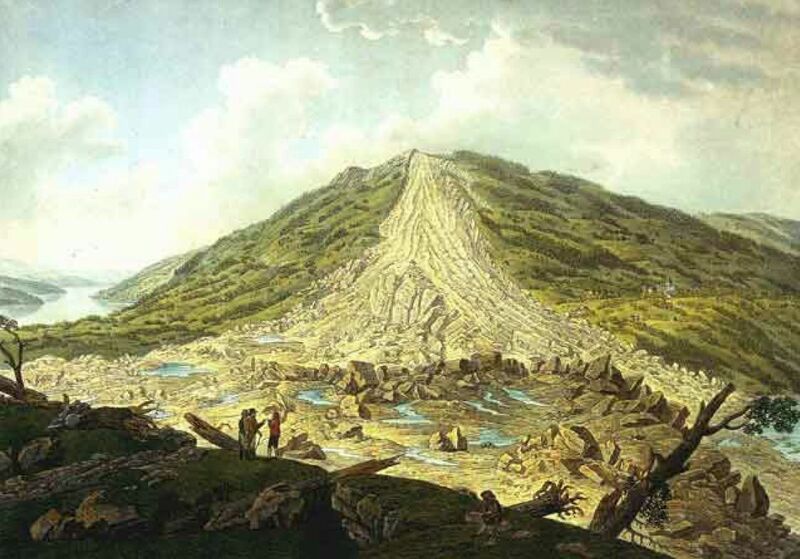 "The 2, September 1806 the beautiful landscape of Goldau was spilled by a landslide from the Rossberg. Approximatively 500 persons found their eldritch grave." "But how in 100 years this Goldau has risen from the ruins! Where in the first years this area remembered more a sea in rage, and just 50 years ago the quiet hiker or pious pilgrim searched for a path between rocks and debris, now the stranger encounters a whole new Goldau, with new traffic, with new streets, stately homes and a new population." 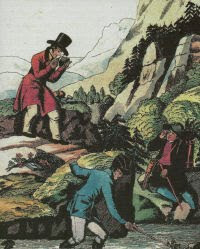 Just one year after the catastrophe the physician Dr. Carl Zay, from the nearby city of Arth, collected eyewitnesses' reports and published the first naturalistic documentation about a landslide entitled "Goldau und seine Gegend". The Rossberg is a mountain situated at north of Goldau, legend tells that a landslide destroyed the surroundings of the mountain nearly 2.000 years ago, in the 14th century a river was dammed up and forced from his old path, and in 1354 the ancient village of Röthen mysteriously disappeared. The village itself stands on ancient landslide deposits. Before the landslide in September smaller rock falls events were observed, but not considerer threatening. The Rossberg consists of a heterogenic succession of argillaceous layers, sandstones and up to 30m thick conglomerate layers, inclined with 20° in direction of the valley floor. Infiltrating water tends to wash out the finer sediments, destabilizing the entire succession. The winter 1805-1806 had large amounts of snowfall, and the summer 1806 was wet, especially July and August were characterized by strong precipitation events. September 2 was a rainy day, and in the morning in the flanks of the Rossberg large fissures were noted. In the forests the sound of breaking trees and roots could be heard, stones "jumped" out of the soil, squeezed by the accumulating tensions, in the meadows small mounds formed, partly superimposed each on another. In intervals of a quarter of an hour rock falls occurred distributed on the entire area. In the afternoon (14.00) the rock fall activity intensified, the rumours of impacting boulders could be heard and a brown dust rose. At the base of the mountain flank soil an rocks were pushed in the height. At 16.00 trees begun to move, and birds and cattle fled from the mountain. At 16.45 finally a part of the mountain begun to slide, accelerating and impacting on Goldau. Fig.1. Painting by Xaver Triner (1767-1824), commissioned by the Government of the Canton Schwyz, see also the paintings by H. Keller. The scar left by the landslide on the Rossberg is still visible today, you can compare the past depictions and the modern appearance on Pathological Geomorphology !! "The soil appears to peel from of each other and turns his green in the brownish colour of the reversed earth, the lower forests move gradually and the fir trees in a countless mass vacillate. Some larger stones are already rolling down the mountain, smashing houses, barns and trees, and throwing themselves down in direction of the valley in a speeding motion, as messengers of the soon following terrible mass. Now suddenly the movement increases, whole rows of pine trees fall in disorder down and in the depths. All detached and mobile, forest, earth, stones and rocks fall slide away, speeding up and finally falling down fast as a lightening. Terrible roar is heard, whole sections of torn up soil, rock pieces as large or larger than houses, whole rows of standing pine trees are thrown trough the air. A terrible red-brown dust raises, wrapping up the avalanche in darkness and running before it as a dark cloud chased by the storm wind. Mountain and valley are shaken, people freeze at the sight, birds, hindered in their flight fall down on the site of the devastation. Houses, people and cattle are thrown above the earth and in the air faster then a cannonball shoot out of a cannon. The flood of Lake Lowerzer, startled from their quiet, rears up and starts over like a storm its devastation. A large part of the shattered masses climbs up the steep foot of the Mountain Rigi and single trees and boulders of rock fly up even higher… in a period of 3 to 4 minutes" it was all over. Fig.2. 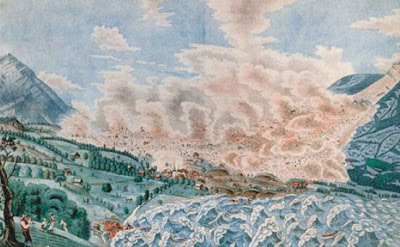 Historic painting of the 1806 AD catastrophe drawn by 16 years old eyewitness David Alois Schmid, who observed the rock avalanche from his hometown Schwyz. In the foreground the swampy western shore of Lake Lauerzer is depicted. Schmid clearly illustrates that upon the impact of the rock masses the substrate of the swampy deposits were laterally ejected towards the lake in vegetated slices reaching heights of small houses. This process subsequently triggered the devastating water waves on Lake Lauerz (figure from BUSSMAN et al. 2010). Fascinating. Over on the Geopathology blog, September has been designated mass-wasting month. I have sort of recreated the two contemporary views you show here. It is amazing how much of the landslide is still evident. Goldau Landslide - ancient and modern.